Based on 'Little Orphan Annie' by permission of Chicago Tribune - New York News Syndicate, Inc. Call it a Dickens-flavored entertainment instead, for Lionel Bart’s music and lyrics are so thoroughly upbeat you might suspect Oliver is related to Mary Poppins. That’s less a criticism than an observation that this family-oriented musical takes some somber deeds and turns them into spirited outbursts of optimism. “Oliver!” does, nevertheless, make an excellent introduction to the theater for young audiences and might even pique their interest in the original, deeper and more complex story. Richter’s production is first-rate and crowded with performers of talent. And, mercifully, the outdoor theater’s acoustics have been tended to — you can hear the voices loud and clear and even identify who’s singing! A cast of more than 50, mostly on the young side, cavorts merrily on the season’s unit set by Andrew Knapp, which in this outing makes its richest impression as various locales in London Town. Sabrina Post assumed the triple role of director, choreographer and musical director, and as usual, such an overload of responsibility leads to occasional oversight. On the whole, however, her work is lively, focused and well-rehearsed. The four-piece orchestra under her baton turned out music that was admirably always in tune and tempo-right. “Oliver!” is the poignant tale of an orphan boy in London in the early 1800s who is sold into servitude to an undertaker, escapes, and joins a group of young pickpockets. The youths are manipulated by master thief Fagin, one of literature’s most controversial characters. Like Shylock in Shakespeare’s “Merchant of Venice,” he is Jewish and can be interpreted as a true villain or simply a man who’s survived adversity. In Richter’s “Oliver! he’s like a flamboyant Scout Master, eager to teach his boys how to earn merit badges in thievery. Marty Koslowski provided the colorful costumes, which follow the lead of the music and look more wholesome than threadbare. The orphans could be angels in a Christmas pageant; the should-be-scruffy pickpockets seem dressed for a Soho sock dance. Bart’s work skims along on the top of Dickens’ masterpiece, touching on high and low moments in Oliver’s search for happiness. But we never once fear for the lad and, in true Dickens’ style, he is reunited with his real family in the end. There’s a black subplot that involves cold-blooded criminal Bill Sykes and his sometimes girlfriend Nancy, a friend of Fagin and his boys. Their relationship and its tragic end are the only really depressing moments in the show. Dickens was only 25 when he began writing “Oliver Twist,” and perhaps this darkly romantic part of the story reflected his own youthful passions. Director Post has wisely cast strong singer-actors in the pivotal roles. David Roth’s Fagin is a clever blend of the droll and the devilish. When his days as a criminal seem numbered, he considers his options in “Reviewing the Situation,” one of the show’s highpoints and a moment of stage perfection. 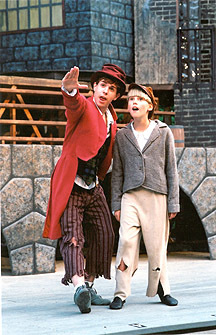 Robert Ferzola plays the Artful Dodger, who recruits Oliver into Fagin’s gang, with an energy that suggests a young Mickey Rooney and the dancing feet of Donald O’Connor. The show doles out its big numbers to a variety of characters, including Chris Lieby as Mr. Bumble, who puts the right wail onto “Boy for Sale,” and to Jon Burch and Anne Giroux as Mr. and Mrs. Sowerberry, the undertakers who quickly size up Oliver up as a perfect coffin follower. The Sowerberrys join Lieby in “That’s Your Funeral,” a good example of black thoughts clothed in bright lyrics. Bret Poulter is Bill Sykes and he’s evil personified. He uses his powerful voice to put a chilling edge on “My Name,” meant to warn the unsuspecting to stay clear. If there is a song in the show that can stand belting, it’s Nancy’s “As Long as He Needs Me.” Juliette Garrison interprets it with both romanticism and fatalism, though I could have done without so much blast on the final reprise. Since music is dominant over the “Oliver” story, director Post seems to have adopted an attitude of let’s get though the songless scenes quickly. The result is a declining sense of tension as the play nears its end instead of a dramatic and tingling finale with Sykes and Oliver fleeing over the tops of buildings. Notwithstanding the lack of truly involving drama, this is a tuneful show that scores points with music and vivid panoply. You need not fear bringing the little ones — they’ll never suspect for a moment that being an orphan is anything less than a lark. “Oliver!” plays Fridays, Saturdays and Sundays at 8:30 p.m. through Aug. 11 at Musicals at Richter, Richter Arts Center, 100 Aunt Hack Road, off Mill Plain Road, Danbury. Tickets are $15, $12 for seniors, $10 for students and children; call (203) 748-6873. The grounds open at 7:15 for picnicking. Chairs may be rented by advance reservation.